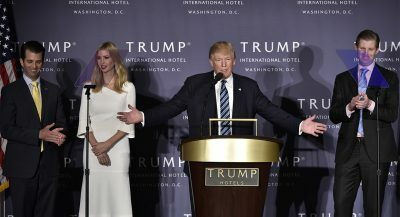 A new federal lawsuit charges that President Donald Trump, his company, and his three eldest children—Don Jr., Ivanka, and Eric—deliberately defrauded working-class Americans by convincing them to invest hundreds or thousands of dollars in sham business opportunities and training programs. It was brought by four plaintiffs who are using pseudonyms because of “serious and legitimate security concerns given the heated political environment.” The plaintiffs’ attorney fees are being covered by the nonprofit Tesseract Research Center, whose chairman is Democratic donor Morris Pearl. Additionally, in June, after a two-year investigation, New York State filed suit alleging that the Trump Foundation, the president’s charity, had engaged in “persistently illegal conduct,” including violations of campaign finance laws and tax regulations, and illegal coordination with his presidential campaign. That case is being held up by an ongoing court battle over whether a sitting president can be named in a civil suit.